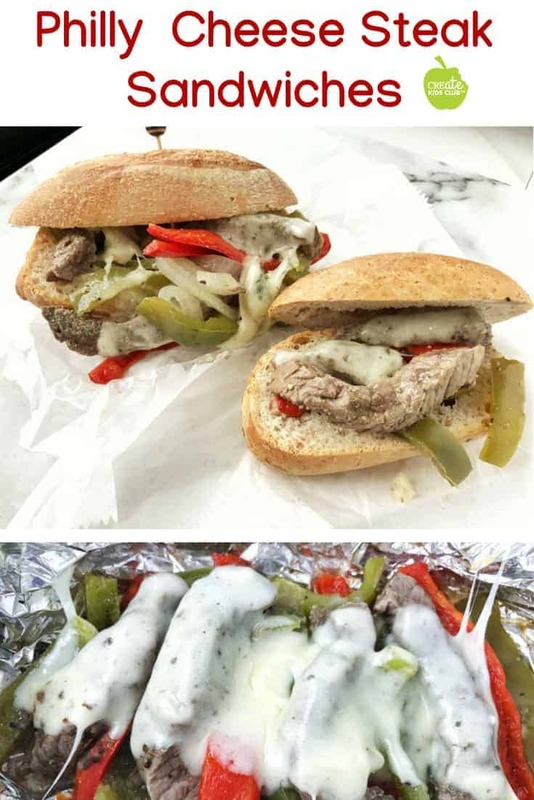 Peppers & onions cooked with steak, topped with cheese, placed on a hoagie & drizzled with all the delicious juices. 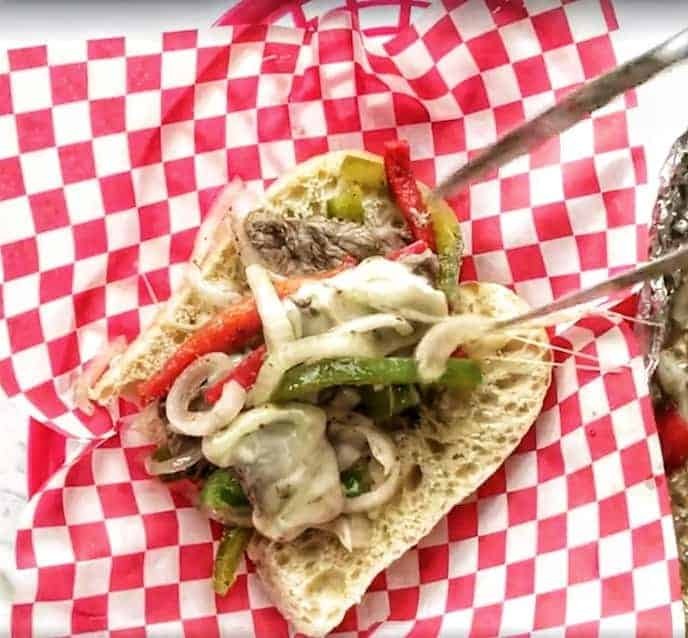 A Philly Cheesesteak with all the flavor, but fewer calories. This post is sponsored by the WISCONSIN BEEF COUNCIL. As always, all opinions are my own. 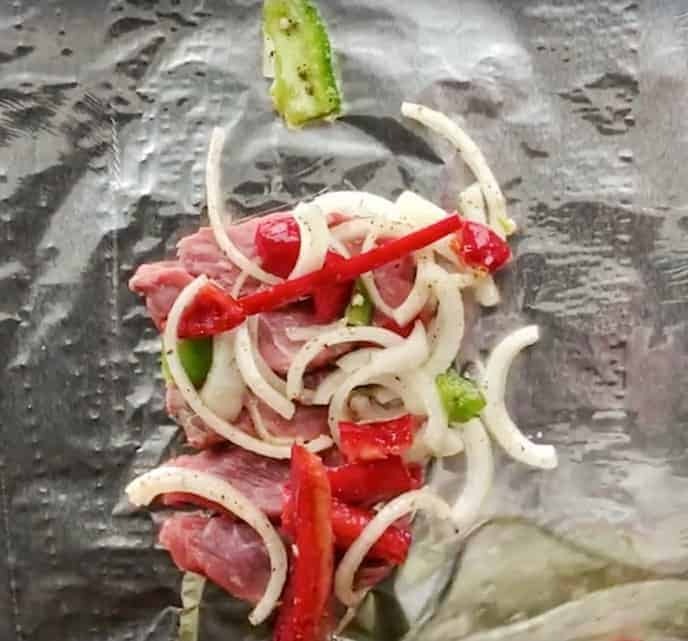 This homemade Philly Cheesesteak recipe is cooked in foil packs making it perfect for grilling, cooking on the campfire, or in your oven at home. If you’re a fan of hot and juicy sandwiches, this one has your name on it. It’s easy to make and delicious enough that both kids and adults love it. This healthy spin on Philly Cheesesteak keeps all the flavor. A big part of the flavor comes down to choosing what meat to use. What Meat To Use For a Philly Cheesesteak Sandwich? Traditionally, sliced ribeye is used for it’s highly marbled (high fat) texture. To cut fat and calories you can use top round like they do at Jim’s Steaks, or top sirloin as we do in the recipe below. Top sirloin steaks are a great value among top quality grilling steaks. They are a lean cut so make sure not to overcook the steak. Pro Tip: To choose lean cuts of beef, look for “Loin” or “Round” in the name. These are lower in fat and calories. Start by slicing an onion, a green pepper, and a red pepper. In a medium-sized bowl, combine oil and spices. 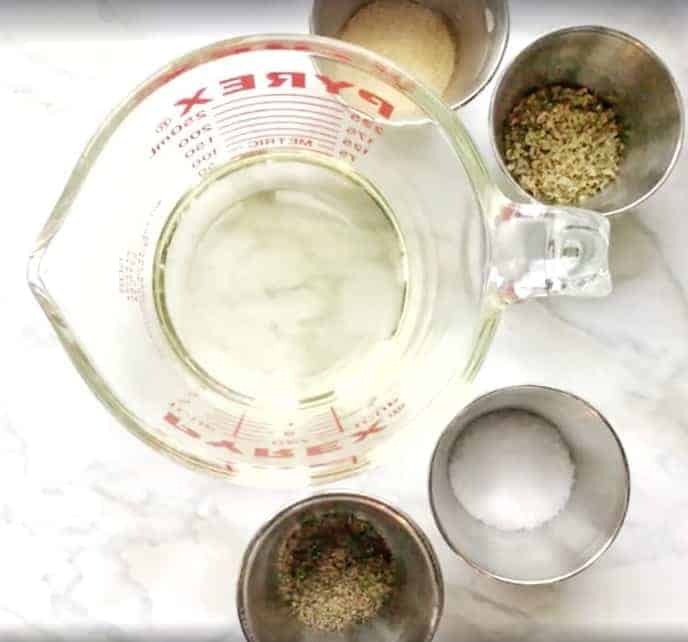 Whisk to blend. Add the oil mixture to the chopped veggies, then stir. Chefs Tip: When cutting meat, always slice against the grain of the meat. This results in a more moist cut of beef. The grain is the direction in which the muscle fibers are aligned, cutting against the grain can make the difference between the tough and tender meat. Click here to read more about the grain of the meat. On a cutting board, slice steak into thin evenly sized strips. Chef’s Tip: Freeze the meat for an hour or so to firm it up before using a sharp knife to cut your slices. This results in easier cutting of uniformly sized slices. Or have your butcher slice it for you at the store. Place sliced steak onto sheets of tin foil, large enough to fit both the steak and vegetables. 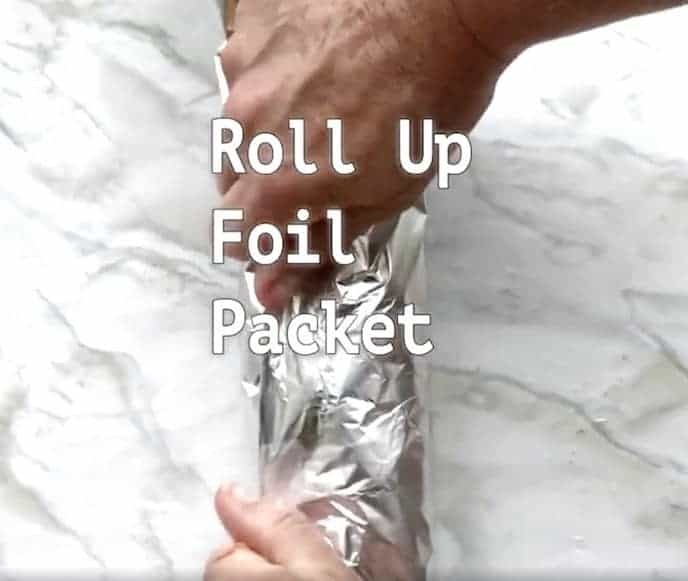 Make sure the foil is long enough to be able to roll it up tightly. Equally, distribute the veggie mixture onto the foil packets of steak. 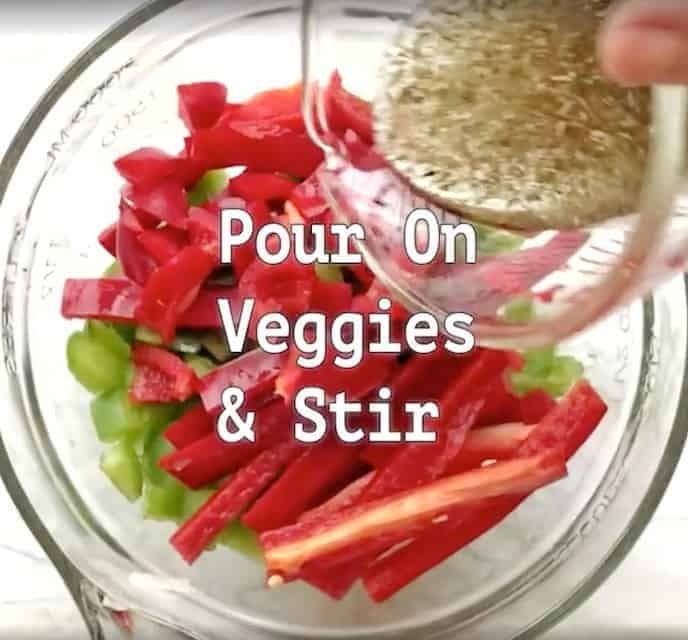 Pour on both the veggies and oil mixture. Carefully roll up each foil packet, start by gathering the sides, meeting in the middle, and rolling over, then roll the ends under tightly. These foil packs can now be kept in the refrigerator until needed, or up to 1-2 days. Cooking time for all of the above is between 10-15 minutes depending on how well done you’d like the steak. After cooking, carefully open the foil packs, one at a time, and add a slice of provolone cheese. Close the foil pack and let melt, 1-2 minutes. Choose your favorite crusty roll or hoagie bread and carefully transfer the contents of the foil pack to the roll, making sure to drizzle with all the delicious juices in the foil pack! What To Put On A Philly Cheesesteak Sandwich? If you liked this recipe, make sure to leave a star rating on the recipe below! Make sure to follow me on social media @CreateKidsClub! 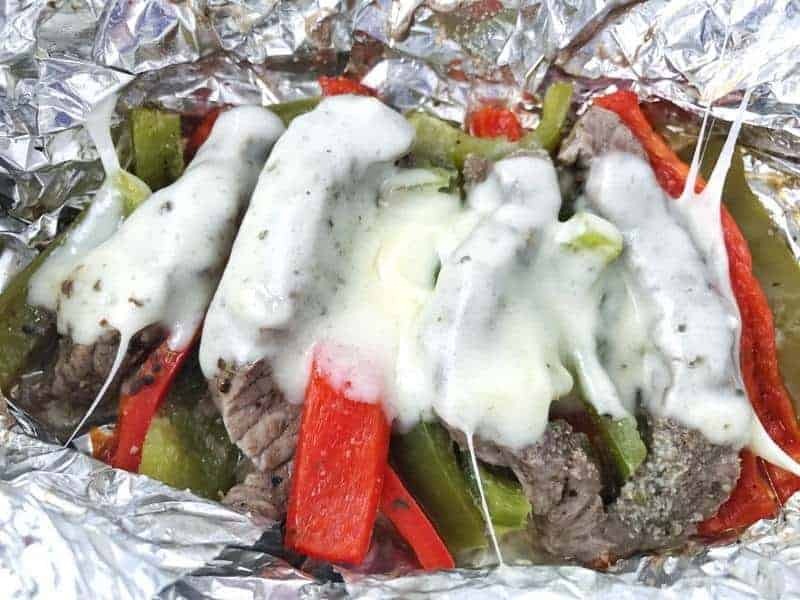 Peppers and onions are marinated with oil and spices, then cooked with steak, topped with cheese, and placed on a crisp hard roll drizzled with juice. 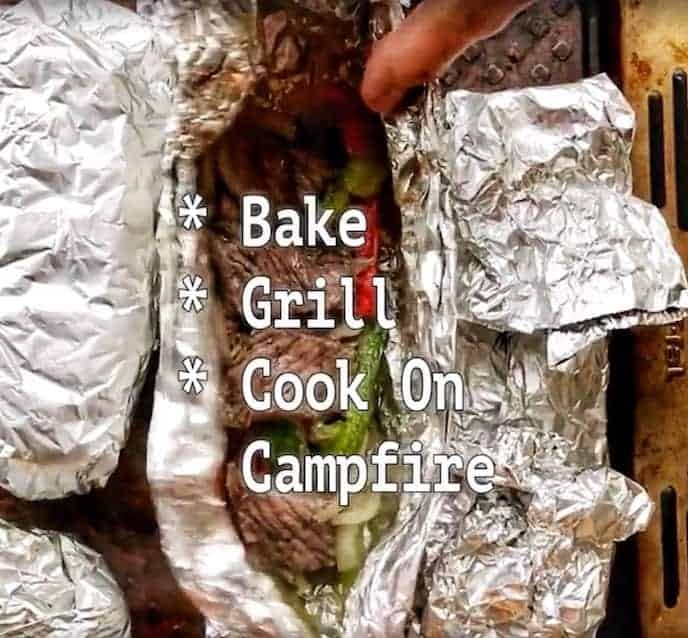 A healthy camping recipe in foil packets that can easily be made ahead of time. Whisk together oil, garlic powder, salt, and pepper. Place sliced onions and peppers in a medium sized bowl. Stir in oil mixture. Distribute steak evenly on 6 sheets of tin foil. 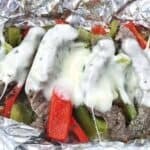 Top with veggies and roll up foil packets. Bake, cook on grill or campfire, for 15 minutes or until steak is cooked to your preferred doneness. Carefully open foil packets and place 1/2 a slice of cheese on top. Close foil packet and let cheese melt. 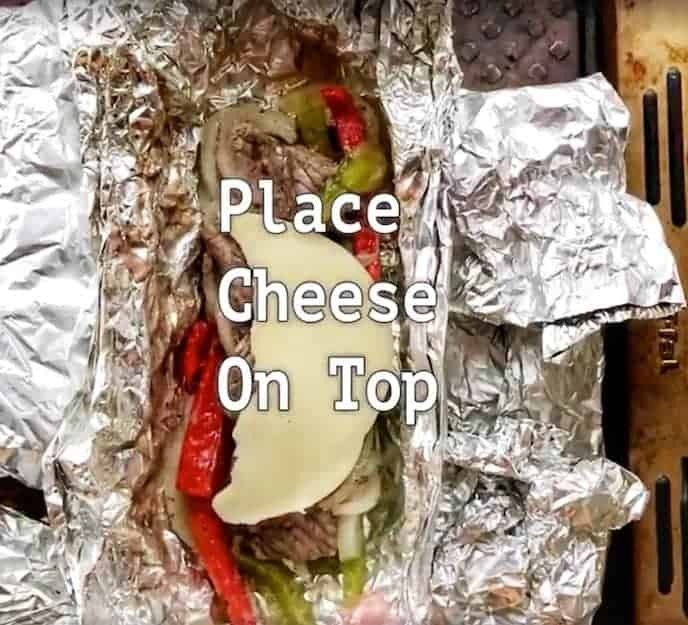 Place steak, veggies, and cheese on top of a hard roll and drizzle with the remaining juices. Always slice against the grain of the meat. This results in a more moist cut of beef. Freeze the meat for an hour to firm it up before using a sharp knife to cut your slices. This looks too good to find on a camping site. Will have to try this next time we are camping. I know, right? Growing up we had sandwiches and hamburgers. These are easier when made ahead of time and only need to be cooked! I’ve cut out nearly all red meat from my diet at my doctor’s request- I think in part due to the confusion over what is lean and healthy. It is too bad there is so much conflicting information out there. As a dietitian, I counsel my patients on moderation and the use of lean cuts of meat. 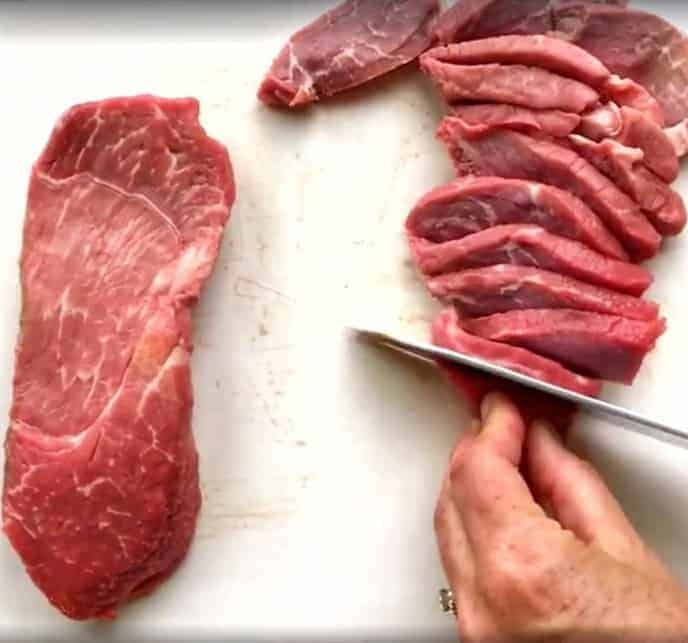 Cuts with loin and round in the name signify lean cuts of meat which meet the following: < 10 grams of fat, < or = 4.5 grams of saturated fat, and < 95 milligrams of cholesterol per (3 1⁄2-oz) serving. I hope that helps! What a delicious dinner idea! Such a simple way to keep the tasty food flowing while enjoying the great outdoors. I love cheesesteaks and could eat one very often! Thanks for this delicious recipe!! I hope you enjoy Olivia! My family is really digging foil meals recently and I have not made Philly Cheesestakes in a long time. Your photography really shows how delicious this recipe is and I am glad that my family can get lowfat protein in beef. What temp and for how long does it need to cook in the oven? Worked great on our camping trip! Can’t wait to try it in the oven.